The Council of Religious Leaders of Metropolitan Chicago has named the Reverend Dr. B. Herbert Martin, Sr. as its new President. Also elected were Ms. Barbara Abrajano (Vice President), Mr. Rohinton Rivetna (Secretary), and the Rev. Arlene Christopherson (Treasurer). Dr. Martin has more than five decades of ministry work including serving as Pastor of Progressive Community Church in Chicago as well as providing pastoral care and support to former Chicago Mayor Harold Washington. He has held dozens of civic roles including Chairman of the Chicago Housing Authority, Executive Director of the Chicago Commission on Human Relation and many others. As president, Dr. Martin will focus on expanding collaboration among Chicago’s religious groups to address issues within their individual communities and continue to build on faith collaboration at CRLMC. Dr. Martin succeeds the Rev. 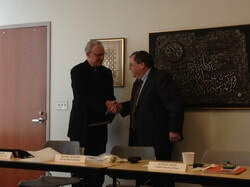 Wayne N. Miller, Bishop of the Chicago Synod of the Evangelical Lutheran Church in America. “I am thrilled to have Dr. Martin take the role as CRLMC President,” said Reverend Miller. “He brings a rich history and fellowship with the Chicago region to the position and will be an asset to the organization and its initiatives." On November 19, 2015 Members of the Council of Religious Leaders of Metropolitan Chicago began their annual retreat with an interfaith prayer service which remembered in a special way the recent attacks in Paris and in other places of the world like Lebanon, Kenya and Nigeria. Leaders of Hinduism, different Christian denominations, Judaism, Islam, Zoroastrianism, Sikhism and Jainism called for God's help in understanding that we are sisters and brothers called to live in harmony with one another, respectful of each person's human rights and dignity. Read more. Michael Balinsky addressing the media at the press conference November 25th. The Council of Religious Leaders of Metropolitan Chicago held a press conference on Wednesday, November 25th at the Chicago Temple. During the press conference Michael Balinsky, president of the CRLMC, issued official statements from the Council on the issues of Islamophobia and the Syrian refugees. Both of these official statements can be found here. 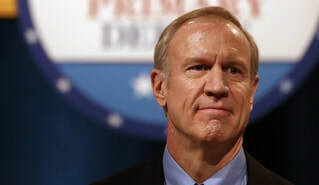 During the press conference Balinsky spoke against behaviors of discrimination of the Muslim community and detested the pause of accepting Syrian refugees by Bruce Rauner. Tabassum Haleem spoke on behalf of the Council of Islamic Organizations of Greater Chicago. Haleem talked about how Muslims are becoming outcasts within our society today. She also spoke out against statements that Ben Carson and Donald Trump have made about the Muslim community. Dr. Balwant Singh Hansra from the Sikh Society of North America briefly addressed the issues facing the Sikh community. Dr. Hansra addressed the issue of identity for the Sikhs in today’s world. Dr. Hansra discussed how the turban is a part of their dress and how Sikhs have experienced discrimination for wearing them. Dr. Hansra closed by simply asking people to be kind to each other. ​The press conference closed with Rev. Paul H. Rutgers, Co-Executive Director of the CRLMC, making a few brief statements. Rutgers discussed how the events that are happening now have an urgency to them that must be addressed. There has been an accumulation of societal issues such as the proposed threats of Muslims and the black community. Rutgers finished by saying that this is a time for the community as a whole to stand up and say we will not tolerate these injustices. "The Council of Religious Leaders of Metropolitan Chicago understands there are deep differences in political and economic values among you, which lead to significant disagreement in public policy. But these differences and their consequence cannot excuse or justify obligations as elected leaders." 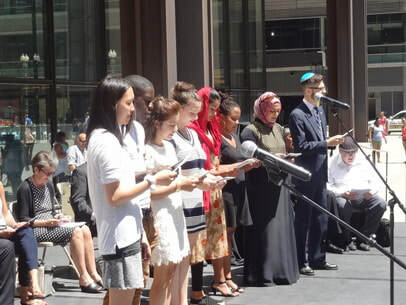 On Friday, July 31st at noon hundreds of people gathered in Daley Plaza as the Council of Religious Leaders of Metropolitan Chicago conducted an InterFaith Gathering in Witness to a Reconciled Community. Some came for the event. Many passers-by stopped and joined, attracted by the colorful group, the varied prayers and the lively music. This annual event was prepared by Bishop Demetrios of Mokissos, Chancellor of the Greek Orthodox Metropolis of Chicago, and Bishop Wayne Miller of the Evangelical Lutheran Church of America. They were joined by thirteen other religious leaders of many different faiths who expressed their sorrow for the violence and prejudice that affect our communities and offers prayers or sacred readings for reconciliation. A special prayer was dedicated to the victims of the shooting of four marines in Chattannooga, Tennessee and of nine members of the African Methodist Episcopal Church in Charleston, South Carolina. The final "litany of hope and coexistence" was recited by a group of young people of very diverse backgrounds and religions, giving a hopeful sign to the gathering. After the final blessing, the attendees sang and clapped together the joyful notes of "We are Marching in the Light of God," sung by Pastor Vickie Johnson. Click here to see the program for the event. Young people of different religions read "A Litany of Hope and Coexistence"
The program is available here. See pictures of the event in the Events Gallery. Please contact the Council of Religious Leaders for more information. 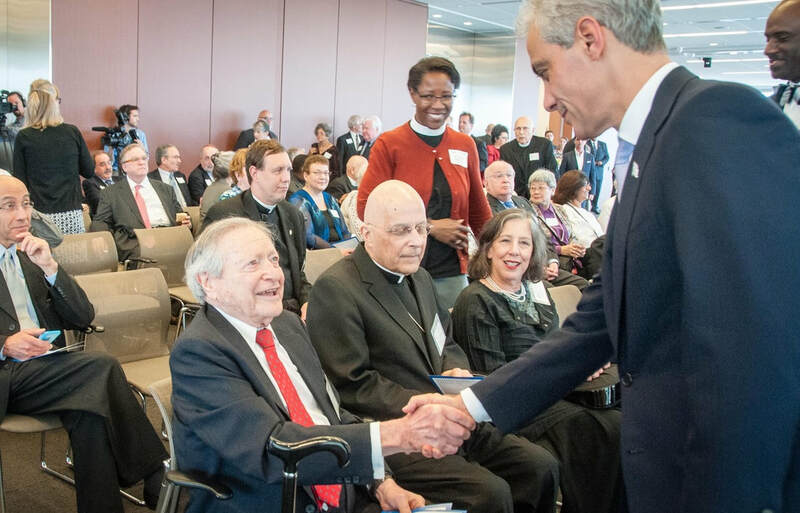 On June 19th, 2014 the Council of Religious Leaders of Metropolitan Chicago honored three particular people who have greatly contributed to the mission of the Council: Rabbi Herman Schaalman, Mrs. Ilene Shaw, and His Eminence Francis Cardinal George. They were the recipients of the 2014 Interreligious Leadership Award. His Eminence Francis Cardinal George, Archbishop of Chicago, has actively served as a member of the CRLMC since 1997. During his ministry he has emphasized the positive role of religion in American life as a service to the community and has promoted interreligious dialogue. Rabbi Herman Schaalman, a long standing and dedicated member of the CRLMC, has devoted his life to promoting interfaith understanding and dialogue. Through his work in educational, civic and religious organizations, he has become one of the most respected rabbis to serve Chicago’s Jewish community. Mrs. Ilene Shaw, under the auspices of the CRLMC, has made possible the production of an InterFaith Calendar featuring 17 different faith traditions describing their basic tenets, beliefs and observances. 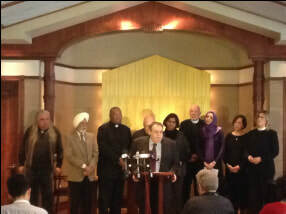 The calendar is recognized nationally as an excellent vehicle to promote interfaith understanding and respect. In their acceptance speeches, the three honorees recalled the past history of the Council of Religious Leaders and expressed their commitment to continue promoting the cause of Interreligious Dialogue at the Council’s table, which is one of cooperation notwithstanding the profound differences in vision and tradition. Present at the ceremony was Mayor Rahm Emanuel, who in his address highlighted the important role of the religious communities in the city of Chicago and his desire to cooperate for the many common causes in the city. The Honorable Anita Alvarez, Illinois State Attorney, also participated in the event, as did many religious leaders and other community members from the region. This ceremony emphasized the role of the Council Religious Leaders as one of collaboration, friendship and fellowship, where religious faiths do not compromise their identity. On the contrary, in a world where religious differences often lead to strife, the Council members use their diversity as a way to dialogue, to get to know one another more deeply and to find areas of fruitful collaboration. February 2014. In honor of World Interfaith Harmony Week, we would like to share an essay written by Chicago-area high school student, Ali Cannon. Ali is a member of the Church of Jesus Christ of Latter-day Saints. Her essay responds to the questions, "What life have you if you have not life together?" Sponsored by: Council of Religious Leaders of Metropolitan Chicago in cooperation with First United Methodist Church at Chicago Temple. Prayers, readings and music were offered by different religious communities. In keeping with tradition, donations were collected to provide THANKSGIVING MEALS FOR THOSE IN NEED. -Religious leaders say action on immigration reform is a “moral responsibility” and call on Congress to resolve differences and allow the democratic process to work. -Leaders call on more than five million multi-faith congregants to contact their Members of Congress and continue prayer, education and action. -Rarity of gathering underscores deep, diverse public support for immigration reform. CHICAGO, Ill., Nov. 19, 2013 – In an unprecedented coming together of diverse religions,leaders representing several faiths across the Chicago area convened to reject recent public pronouncements that immigration reform was dead and demand that Congress, including the Illinois Congressional Delegation, act on immigration reform with a sense of urgency. 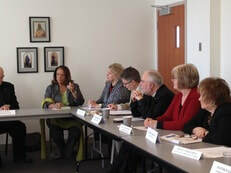 The religious leaders, including Rabbi Shoshanah Conover, Temple Sholom of Chicago; Pastor Wilfredo De Jesus, New Life Covenant Church; Francis Cardinal George, OMI, Archbishop of Chicago; Rt. Rev. Jeffrey Lee, Bishop of the Episcopal Diocese of Chicago; Imam Matthew Ramadan, Deputy Executive Director, The Council of Islamic Organizations of Greater Chicago and Very Rev. Donald Senior, President, Council of Religious Leaders of Metropolitan Chicago, collectively represent more than five million multi-faith congregants across the Chicago area. A stunning 1,100 families across the country are separated each day by deportations. The religious leaders discussed the number of deportations, as well as the overwhelming public support for immigration reform, stating that their congregants are unwilling to wait any longer for their elected officials to debate and vote on the issue. “As people of faith, we are called to give aid and comfort to immigrants. More than a public policy issue, people of faith see this issue as a fundamental matter of how we must treat one another to become the kind of people God calls on us to be,” said Rabbi Shoshanah Conover. 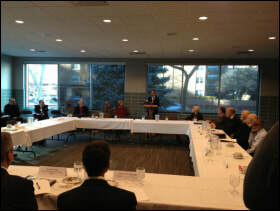 The religious leaders also outlined various initiatives that each of their communities are organizing including “Immigration Sabbath,” a 40-day call to action where people of faith pray, reflect and mobilize around immigration reform, and “40 Days of Prayer, Fasting and Action for Congress,” which will extend through Advent and Christmas. “We believe the inaction on this issue is a temporary stumbling block. Through continued prayer, education and action, we believe Congress will do the right thing,” said Pastor Wilfredo De Jesus. "As people of faith, we are mandated to welcome the stranger in our midst, for we too once wandered in a strange land," said Bishop Jeffrey Lee. "Now, across Illinois, we are speaking with one voice: Congress must put aside partisan politics in favor of moral courage. Our communities cannot wait. Too many families have been torn apart, too many hardworking people have been forced to live in the shadows in fear. The time for immigration reform is now." On October 24, 2013, Barbara Byrd-Bennett, CEO of Chicago Public Schools, spoke at the CRLMC meeting. Barbara informed us about the many initiatives underway within the Chicago Public Schools system, future hopes for the city's children, and ways everyone can get involved. October 1-2, 2013. The Conference gathered at Garrett-Evangelical Theological Seminary and satellite sites in Chicago (North Side, South Side, and Aurora) and Geneva, IL. It was also streamed to AAPC (American Association of Pastoral Counseling) sites across the country. On Tuesday night, the Conference began at Garrett-Evangelical Theological Seminary with a plenary session featuring the Rev. Gary Gunderson, Professor of Faith and Health of the Public, Wake Forest University School of Divinity. The introductory plenary was web streamed to all satellite sights. On Wednesday, all campuses hosted a morning plenary and then gathered in small groups focused on empowering congregational leaders to help constituents access health care benefits. The Conference was sponsored by Garrett-Evangelical Theological Seminary, the American Association of Pastoral Counselors and the Center for Religion and Psychotherapy of Chicago in partnership with The Campaign for Better Health Care, The Center for Faith and Community Health Transformation: Advocate Health System, Samaritan Counseling Center in Naperville and the Center for Religion and Psychotherapy of Chicago. One Nation. One Family. One Dream. A Concert for the Journey. September 30, 2013. Francis Cardinal George, O.M.I., Archbishop of Chicago and The Office for Immigrant Affairs and Immigration Education hosted a night of music and celebration to benefit the Office for Immigrant Affairs and Immigration Education. The Council of Religious Leaders of Metropolitan Chicago mourns the loss of one of our founders and past presidents, Bishop Timothy Lyne. Bishop Lyne died on Wednesday, September 25th at the rectory at Holy Name Cathedral. He was an early leader in ecumenical and interreligious activities in the Chicago metropolitan area. Throughout his long ministry, Bishop Lyne was a consist voice for the inclusion of all persons of faith at tables of dialogue, understanding and social action. Above all Bishop Lyne was a man of deep faith. Tim was the grandest of men and the dearest of friends to many of us. His sweet spirit and wise counsel were God's gift for so many years. We shall miss him dearly. September 15, 2013. The Church of Jesus Christ of Latter-day Saints, Naperville Congregation, presents guest speaker, Ahmad S. Corbitt, Director of the New York Office of Public and International Affairs, The Church of Jesus Christ of Latter-day Saints. On the occasion of the death of His Holiness Pope Shenouda III, the Council of Religious Leaders presents its sorrow and sympathy to the Coptic Orthodox community in Chicago. Bishop Demetrios of Mokissos, past President of the Council of Religious Leaders of Metropolitan Chicago, and Rev. Paul Rutgers, Co-Executive Director, will represent the Council at the Memorial for Pope Shenouda III which will be held in Burr Ridge, Illinois. 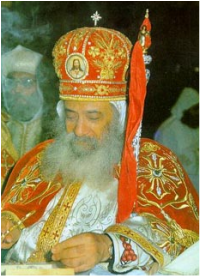 His Holiness Pope Shenouda III passed away on March 17, 2012. He was born in 1923 and enthroned as the 117th Pope of Alexandria on November 14, 1971. Besides being a dynamic preacher and teacher, an author and poet, he was a renowned ecumenist.